For the second year in a row, Terry Schreep, president of Coyote Construction & Remodeling, Inc. accepted "DelChester Contractor of the Year 2008" Awards from the DelChester Chapter of the National Association of the Remodeling Industry (NARI) at their annual awards banquet held Friday, February 1, 2008. Coyote won a first place award in the remodeling category "Entire House Under $250,000," and an honorable mention award for "Residential Interior Over $100,000." 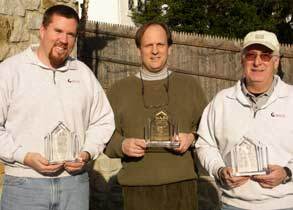 Winners for the DelCY awards were selected in recognition of their remodeling work performed during 2007. Judged by experts from within DelChester NARI's own membership, an award-winning entry had to demonstrate superior craftsmanship, the ability to meet client needs, and overcoming difficult obstacles. "It's a privilege to win an award two years in a row. These projects demonstrate our creative space design, use of unique materials, and exemplary craftsmanship." stated Mr. Schreep. Coyote provided design/build services for completely renovating an 1100 square foot, two-story loft apartment located in a restored mill along the banks of the Brandywine River in Wilmington, DE. The homeowner wanted a space that allowed for entertaining friends, as well as displaying his unique collection of art. Our challenges for this project were to get the most use of space from the available square footage, to use materials that reflected the homeowner's taste in modern design, and to preserve the historic feel of the apartment. We provided an open-kitchen design with eat-in bar connecting to the living area; master bedroom suite sanctuary; master bath with whirlpool tub; remodel of existing powder room; space-saving storage; use of unique lighting, upscale materials and unusual wall coverings. Coyote converted 1325 square feet of an unfinished basement into a kid-friendly, family-oriented living and entertainment area. This blended family wished for: home theatre area with surround sound; full wet bar; entrance to/from pool, allowing for backpack and towel storage; exercise room overlooking pool; sauna; full, eat-in kitchen; full bath with shower; finished closet pantry; and unfinished storage space. Our design incorporates finishes that will withstand the pounding of kids, yet features many unique, striking architectural details that mirror the sophistication of the rest of the home. This includes: curved walls, honeycomb-style "tray" ceilings, tile flooring, African Rosewood bar top, colonial columns and decorative molding, and accent lighting. 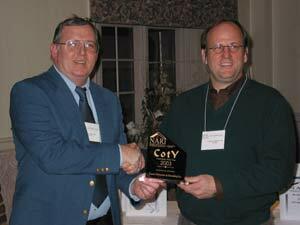 Terry Schreep, President of Coyote Construction & Remodeling, accepted three "DelChester Contractor of the Year 2007" Awards from the DelChester Chapter of the National Association of the Remodeling Industry (NARI) at their annual awards banquet held Friday, February 9, 2007 at the Desmond Hotel in Malvern, Pennsylvania. Winners for the award were selected in recognition of their previous years' achievements. Judged by experts from within DelChester NARI's own membership, an award-winning entry had to demonstrate the ability to meet client needs, problem solving, craftsmanship, aesthetics, innovation, functionality, and degree of difficulty. Honorable mention - Residential Interior Over $100,000. 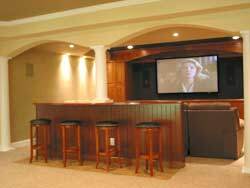 A 1720 square foot unfinished basement was converted into a multi-use living and entertainment area. As designer, the greatest challenge was integrating architectural details that matched the sophistication and stylishness of the rest of the home. Client wish list included: a home theatre with projection television; a wet bar/kitchenette with seating for six; a full bath with a shower and linen closet; an exercise room; and additional space for games. Our design accomplished this and more: elliptical arches, multiple "tray" ceilings, custom cabinetry, African Rosewood "Bubinga" bar tops, colonial columns and decorative molding, and accent lighting highlighting the details. Friends Home for the elderly, in Kennett Square, facing competition from newer retirement communities, elected to eliminate its out-dated communal bathrooms, and provide private baths for each resident's room. As a design/build firm, we reworked the preliminary plans which didn't account for hidden structural and mechanical issues. 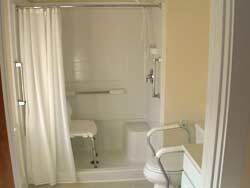 We redesigned rooms to maximize space, storage, and accessibility for people with limited mobility. We also remodeled the Beauty Parlor; created three new half baths; redesigned the nurse's station, office, and reception; and created a pantry. Work was performed while the facility was fully operational. Working from owner-supplied plans, we were challenged with making this 500 square foot addition match the existing home - both inside and out. The client wished for a seamless flow from the existing dining room to the new vaulted-ceiling entertainment room. They also wanted to ensure that the designer's unique, new "funky roofline" appeared as though it had always been there. To provide this flawless look, we matched interior flooring, paint, trim and doors. 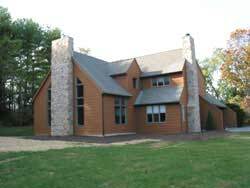 Externally, we installed high-performance windows to match existing; refaced existing fireplace chimney with stone veneer to correspond with new fireplace; replaced shingles; and repainted the entire home. An abandoned farmhouse built in the 1850's was restored to create additional overflow living space for relatives and business associates and to create a pool house for an in-ground swimming pool. We also landscaped the area around the pool to connect the pool and the farmhouse. All exterior restoration was required to meet the specifications set by the local Historical Commission. The National Association of Remodeling Industry's local chapter, DelChester NARI, serving Delaware and Chester Counties, presented Coyote Construction and two other members the "2003 CotY Award (Contractor of the Year)." 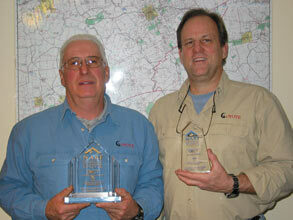 NARI is the only trade organization dedicated solely to the remodeling industry. With more than 5800 members nationwide, the Association, whose national headquarters is based in DesPlaines, Illinois, is "The Voice of the Remodeling Industry." Awards are part of an annual competition held by NARI National and the CotY Award is considered the premier competition in the remodeling industry. Chapters throughout the U.S. hold their local annual competitions as well. 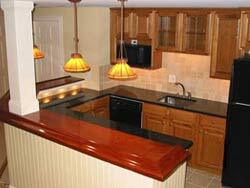 The competition covers a variety of remodeling categories. The winners are based on each entrant's "Before and After" photography and project description. Judging was based on problem solving, functionality, aesthetics, craftsmanship, innovation, degree of difficulty and entry presentation. 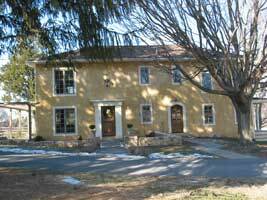 Coyote provided design/build services to remodel this farmhouse originally built in the 1860's. 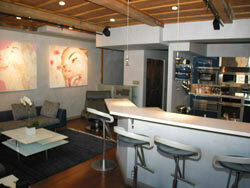 They opened and enlarged the first floor and installed a modern kitchen/dining and entertainment area. They also created a new second floor addition to accommodate a master bedroom suite with a sitting area, a walk-in closet, and a master bath with large stall shower. 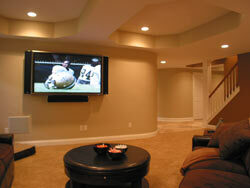 This 2100 square foot unfinished basement was converted into a multi-use living area. It included: a bodega, or wine-tasting room; a hidden Murphy bed; tiled custom steam shower; 4-person sauna; living area with stone fireplace; kitchenette with granite countertops; an exercise room; and an office. Coyote Construction & Remodeling Inc.
© 2008 Coyote Construction Corporation All rights reserved.